Broiler and Replacement Chickens– Use for the treatment of disease outbreaks of coccidiosis, fowl cholera, and infectious coryza. Meat Producing Turkeys– Use for the treatment of disease outbreaks of coccidiosis and fowl cholera. Dairy Calves/Heifers and Beef Cattle– Use for the treatment of shipping fever complex and bacterial pneumonia associated with Pasteurella spp. 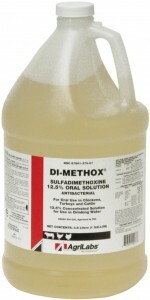 sensitive to sulfadimethoxine.